NADA issued a new report on electric vehicle value retention and unsurprisingly the Tesla Model S tops the list. The Model S retains an impressive 57.2% of its value after 3 years. In comparison, segment averages for gasoline-powered luxury large, mid-size, as well as compact cars fell between 49.5% and 46.2% for the same period, according to NADA. Another win for Tesla, coming in second on the electric vehicle chart by retaining 47.6% of its value is the Toyota RAV4 EV, which is powered by a Tesla drivetrain. For the three-year period, you have to go down to the third position to find a vehicle that Tesla has nothing to do with, the Ford Focus Electric, which retains 31.8% of its value after 3 years according to NADA. This bodes well for Tesla which offers a “Resale Value Guarantee”. The Model S owners participating in this program can sell their car to Tesla during the period between 36 months to 39 months of the ownership for 50% of the base price of the Model S at the time of the purchase, plus 43% of the original purchase price for all options on the car. This program was a bet for Tesla, who at the time wanted to put at ease the minds of potential buyers, but it looks like their bet paid off because if NADA’s report is correct, owners participating in the Resale Value Guarantee program will have no reason to sell their Model S to Tesla and if they do, Tesla should be able to make a decent profit on the guaranteed price. 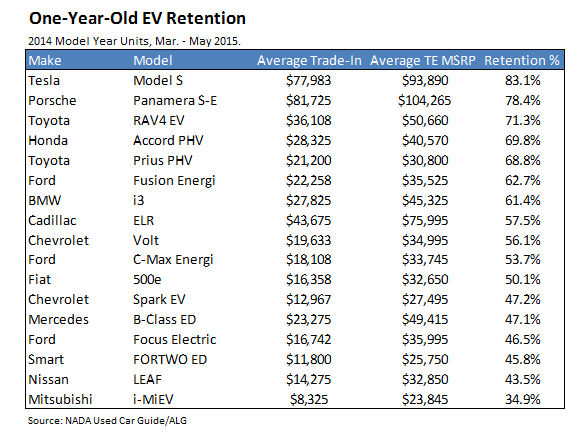 Looking at the one-year list we can see how the most recent entries on the EV market are doing in term of value retention. You can access the NADA report here.